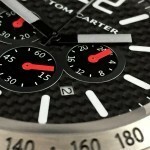 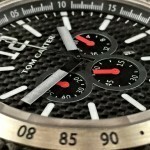 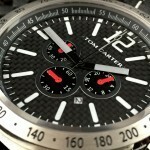 Tom Carter is a new brand, with their headquarters based in Cyprus. 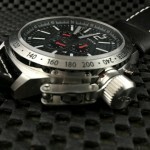 If you are not familiar, Cyprus is an island below the country of Turkey. 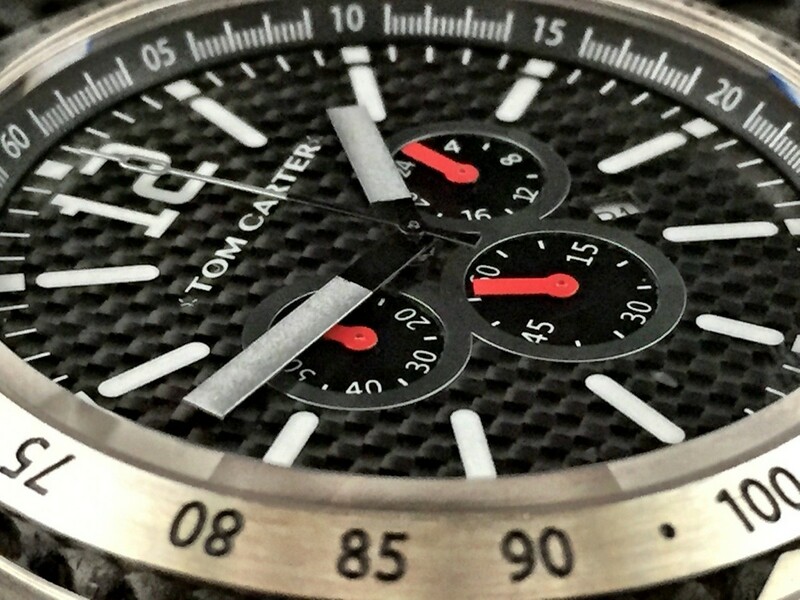 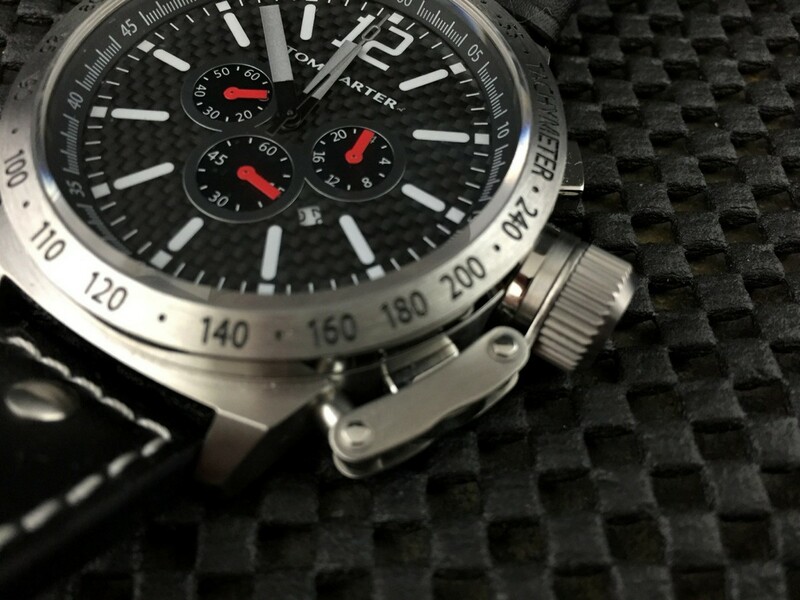 The model that I will be talking about here in the review is their upper tier model from the collection, even though the watch is only priced at $360: the Tom Carter Black Carbon. 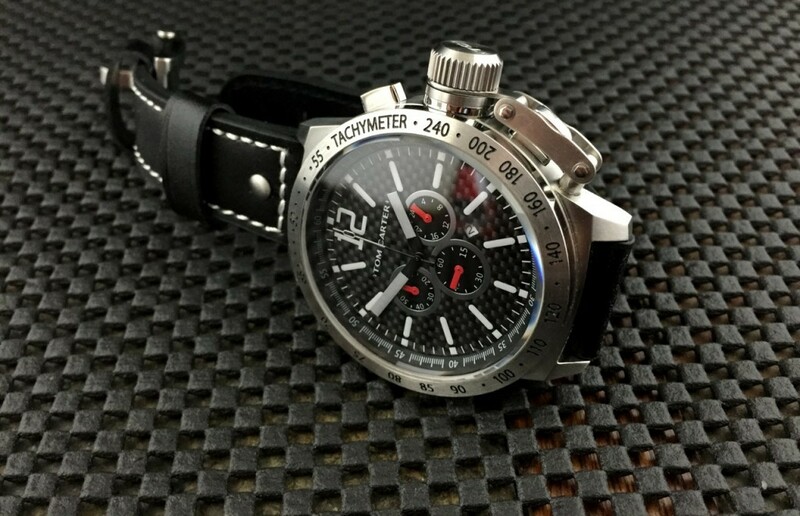 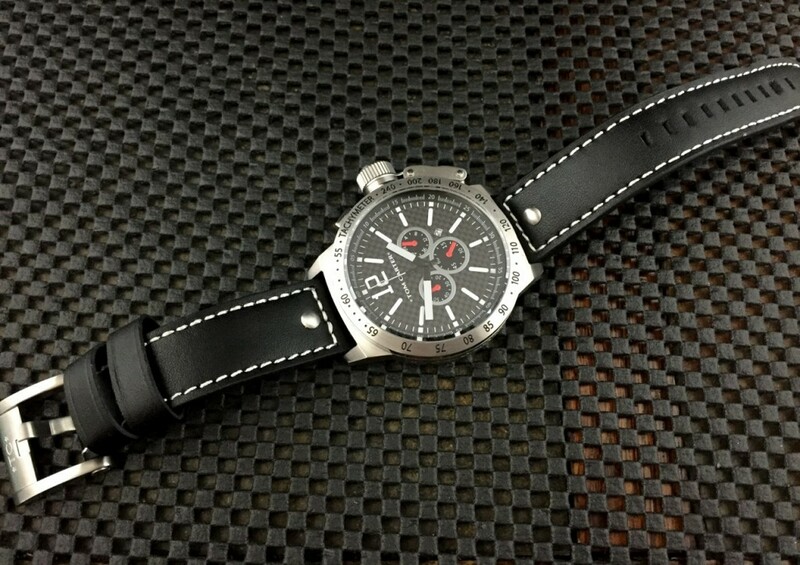 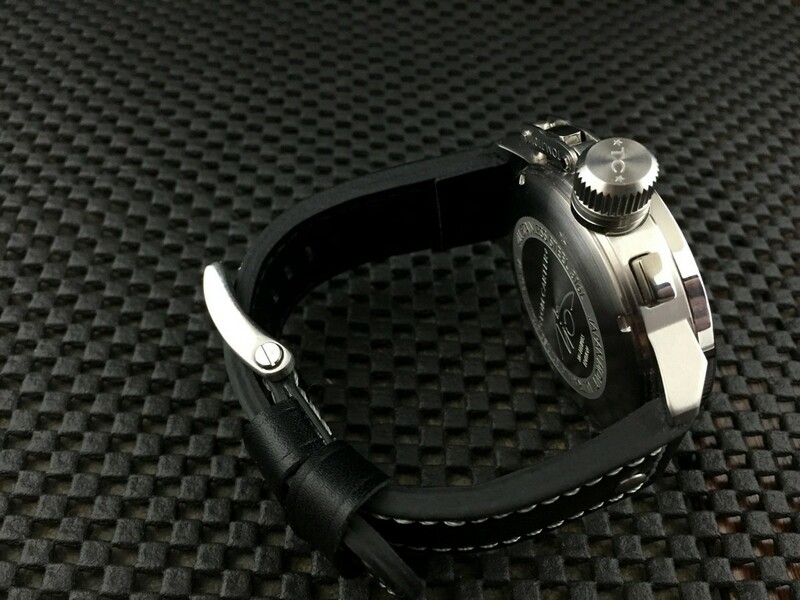 It has a Miyota quartz movement, carbon fiber dial, sapphire crystal, and is 50mm in diameter. 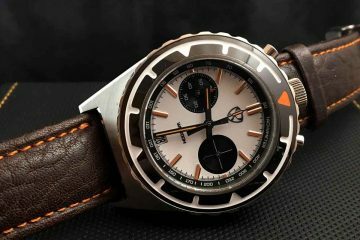 Be prepared to be noticed while wearing this watch. 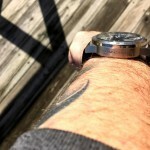 Big and bold, that is for sure. 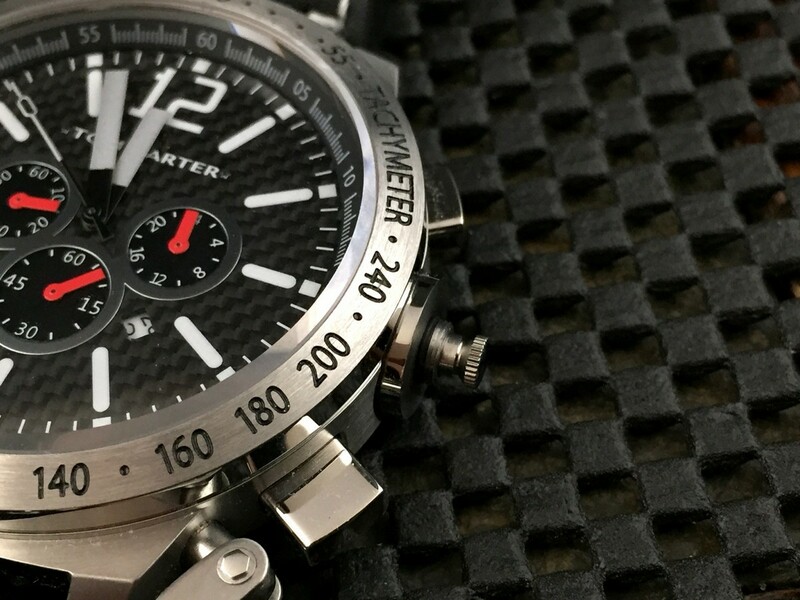 Most will look at the photos and the video and say, “well, that watch has a similar look to a few different companies”, and there’s no denying that. 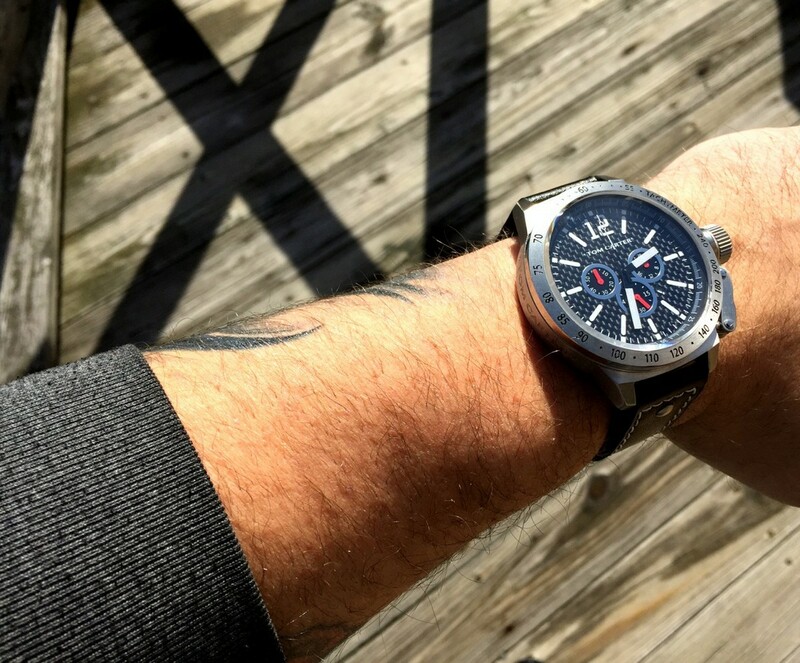 With the large case and canteen crown, this is not the first company to use this style or design, but I review many of watches that use similar cases, dials, or are homages. 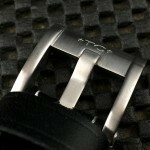 So I am not going to concentrate on that, I will leave that up to you. 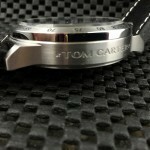 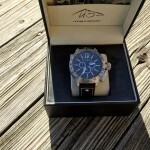 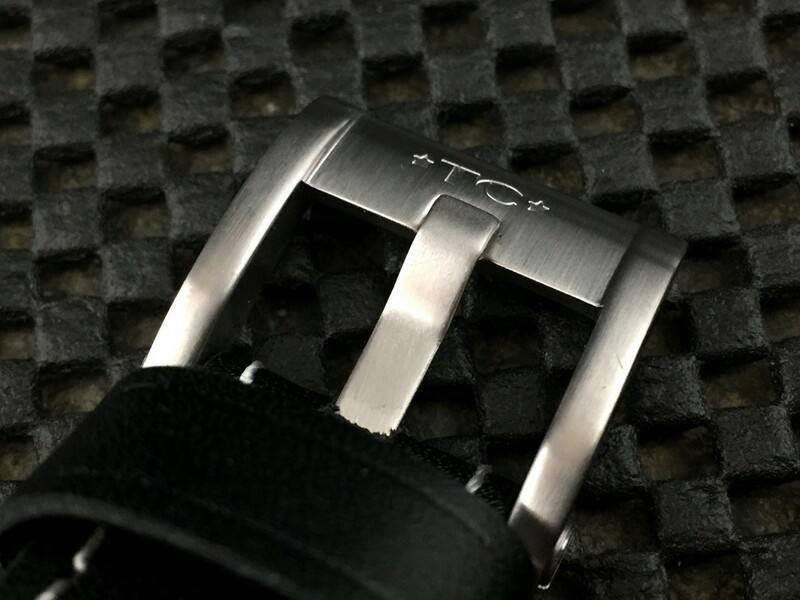 What I will do is give you the good, the bad, and ugly if you will on the Tom Carter Black Carbon. 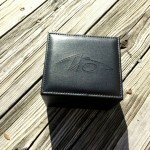 Take a look at the video presentation below for my initial impressions and an HD view. 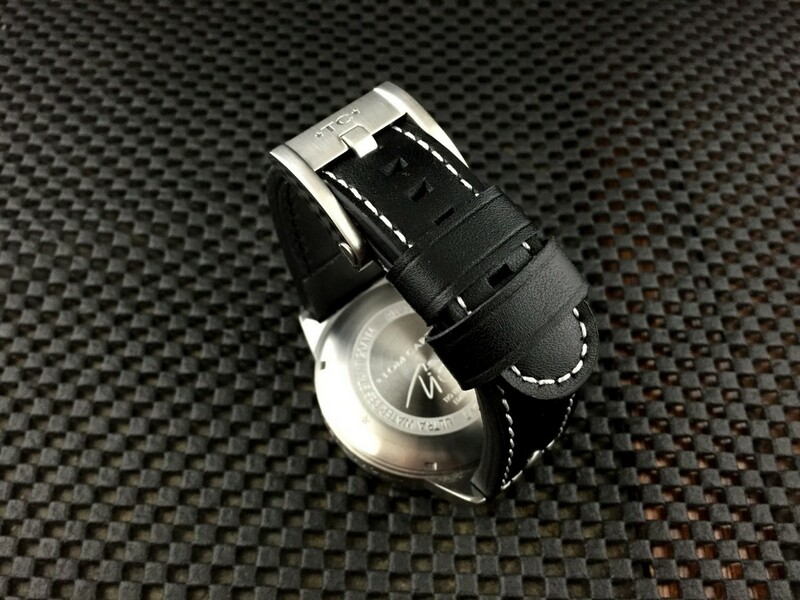 The case is oversized at 50mm wide and 59mm long, so definitely not a watch for the meek or timid. 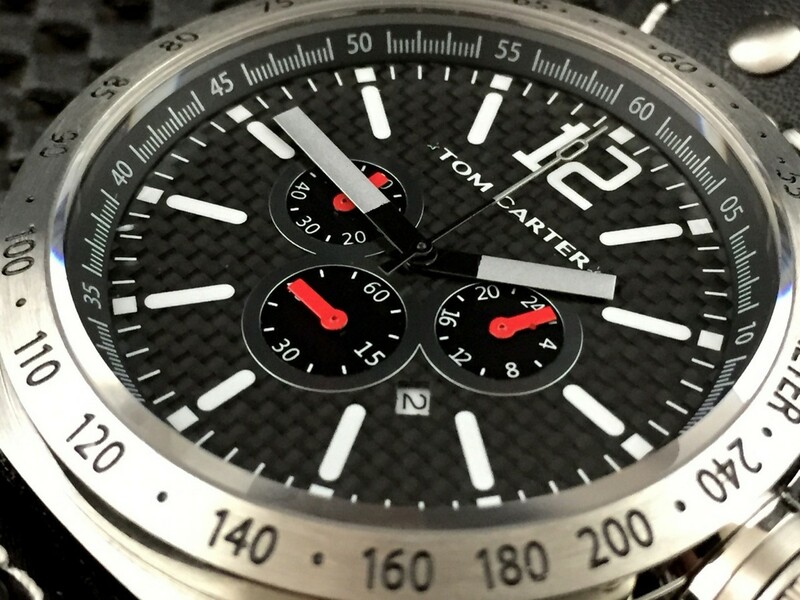 Being honest, these days the Tom Carter Black Carbon is a little imposing for me, as I mostly wear watches in the 44mm range. 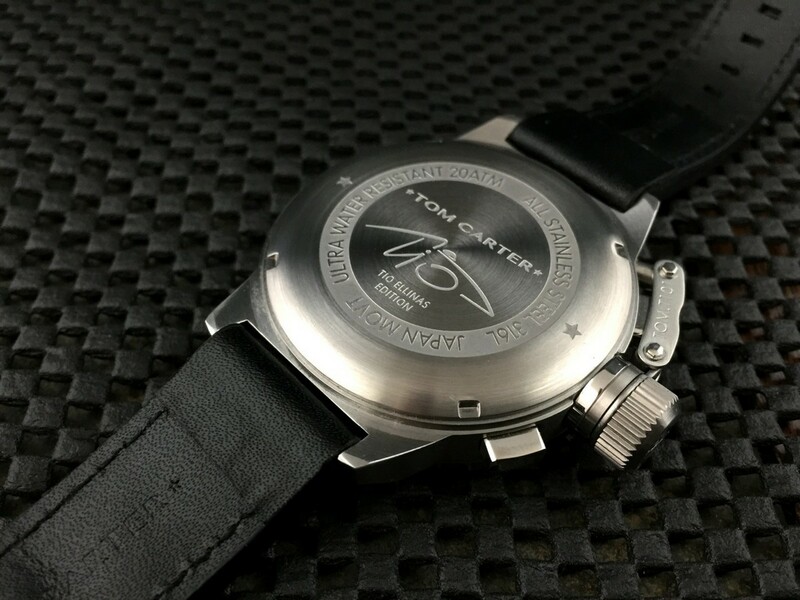 With that said, while the written specifications initially made me think it was going to look ridiculous on my wrist, it actually didn’t look that bad. 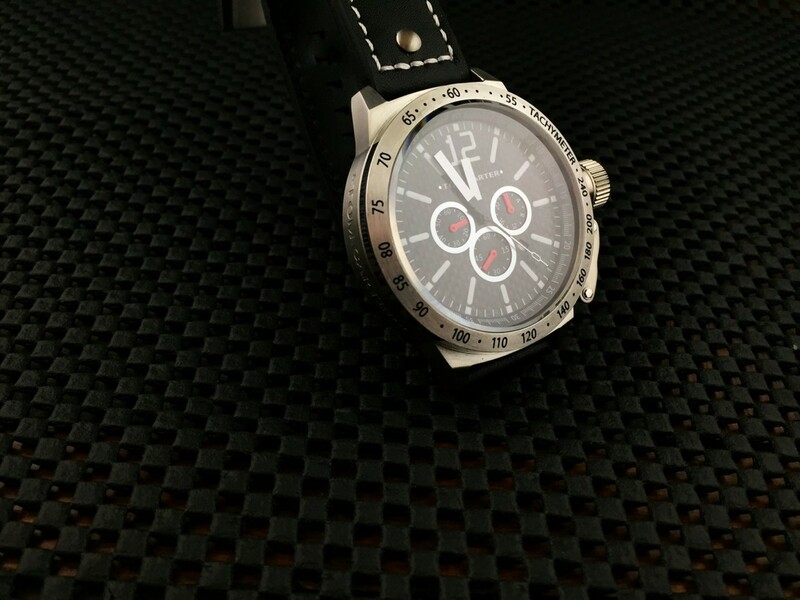 With a combination of brushed and high polished finishes, the case has a nice look to it. 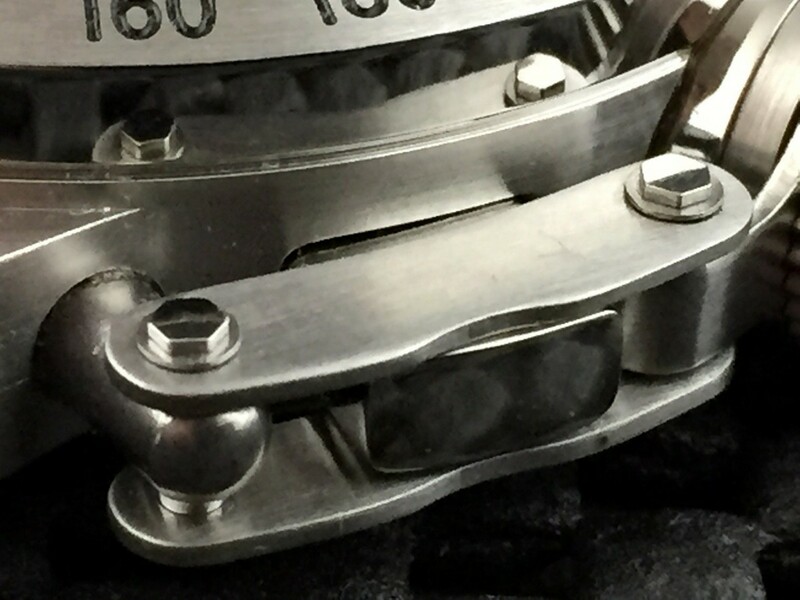 The brushing on the latch of the canteen-crown looks a little rough to me, but the rest of the case seems very nicely finished. 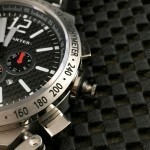 The canteen-crown screws down smoothly, and when removed reveals the tiny time setting crown. 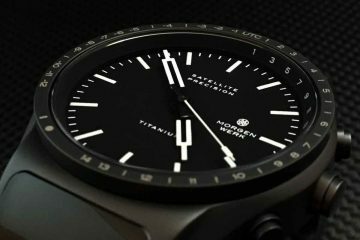 No issues here with the chrono or time setting functions, and the canteen-crown helps keep the watch safe in the water up to 200 meters. 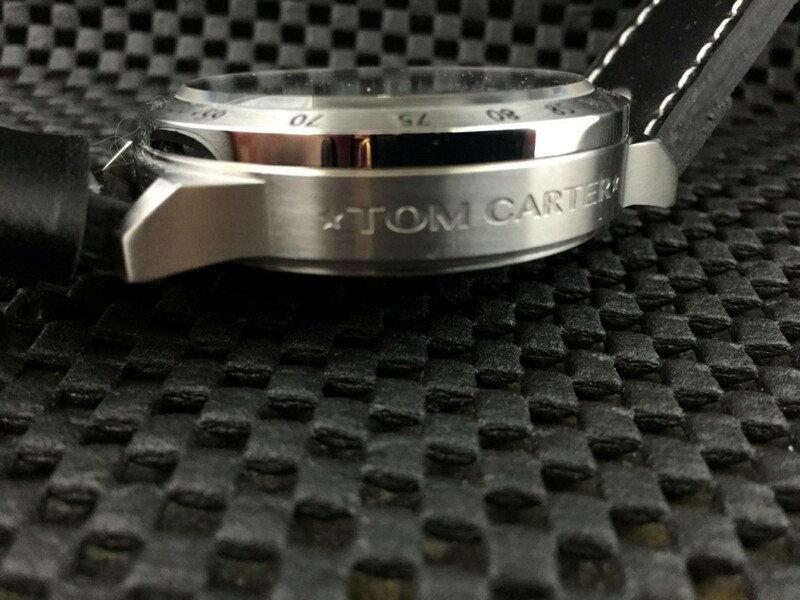 Engraved into the non-crown side of the case is the Tom Carter name, something I am just not overly fond of, but that is just pure opinion. 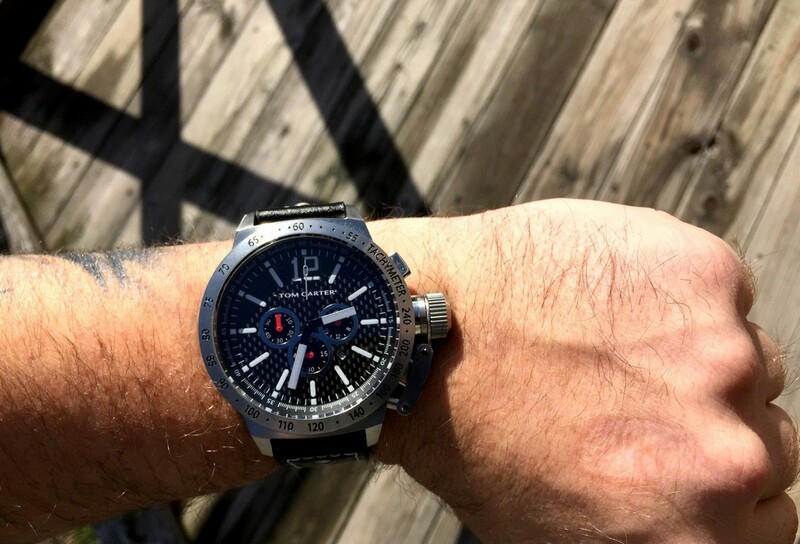 I usually like the less is more approach. 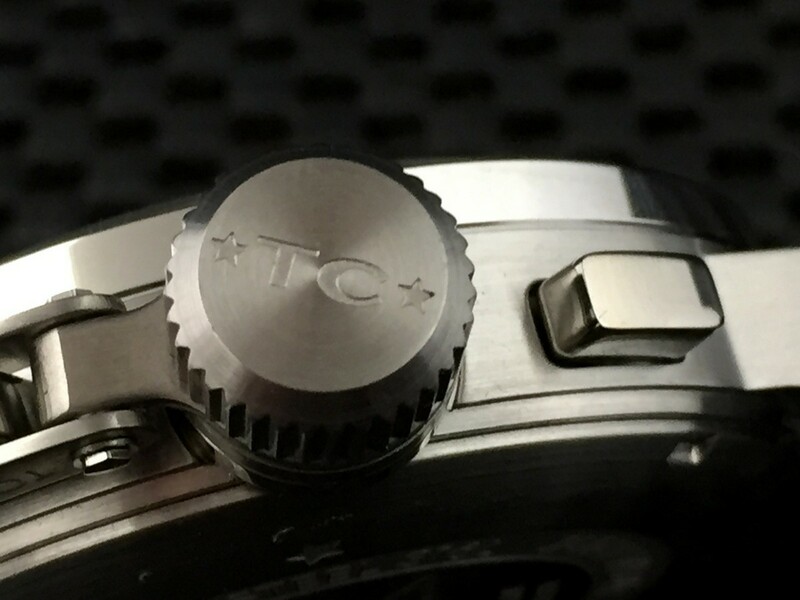 The case back has a nice combination of brushed and frosted finishes and is engraved with a Tio Ellinas signature. 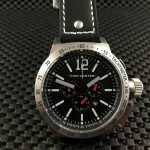 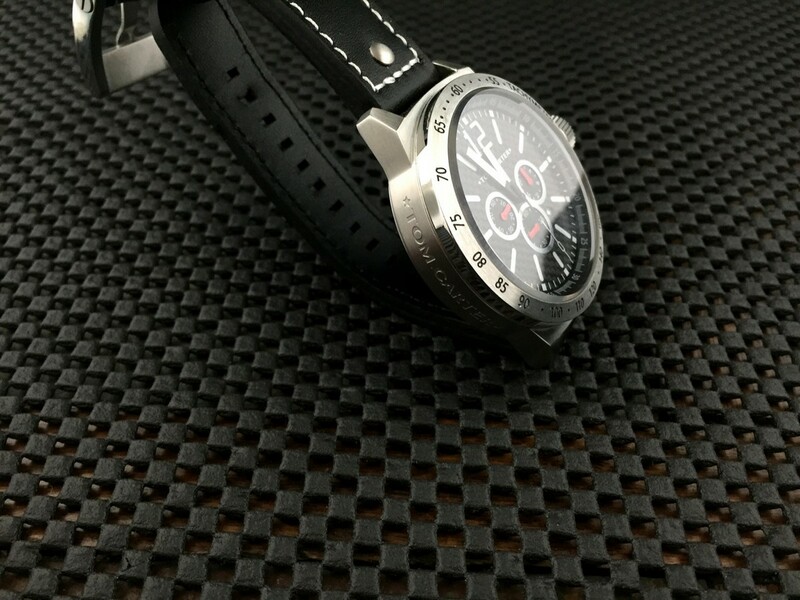 The black carbon fiber dial appears, at least to me, to be real carbon fiber and not a laminate, but of course without disassembling the watch, I cannot be 100% sure. 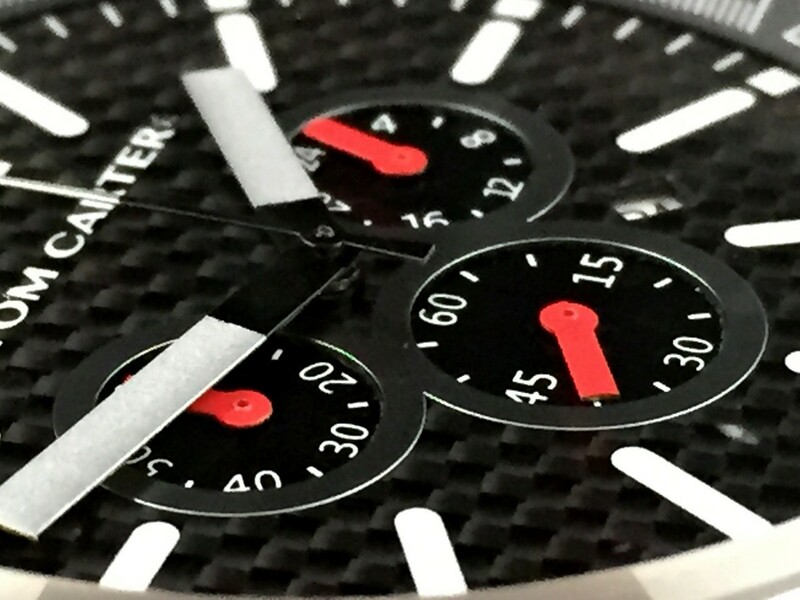 The hour and minute hands are painted black and silver, and the numbers and hour markers are painted in white. 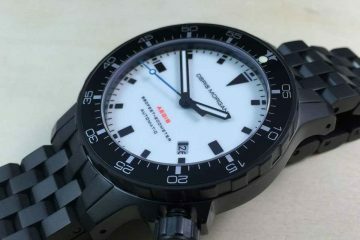 Note there is no luminescent paint applied to this watch. 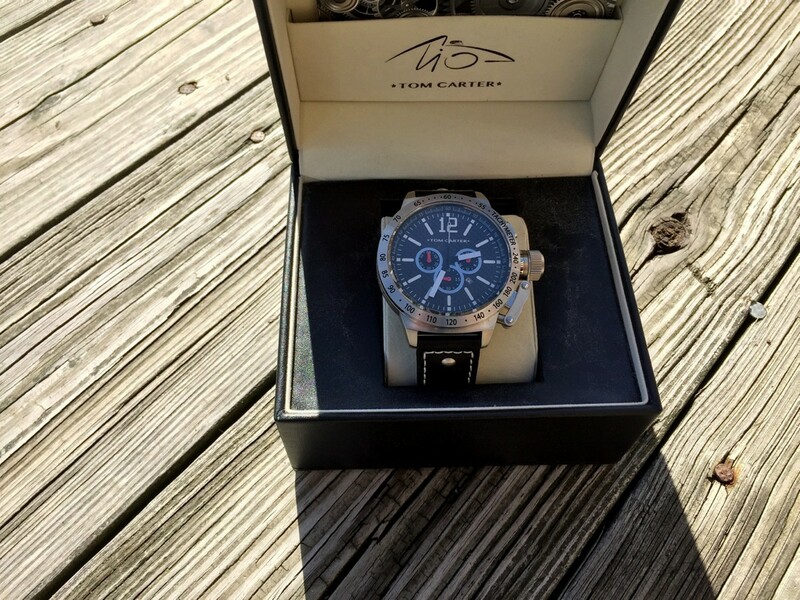 I am not sure why Tom Carter went this route, but if you are someone that needs lume on a dial, this is probably not going to be the watch for you. 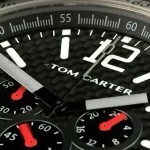 I have not seen other Tom Carter models in person, so I am not sure if others in the collection have lume or not. 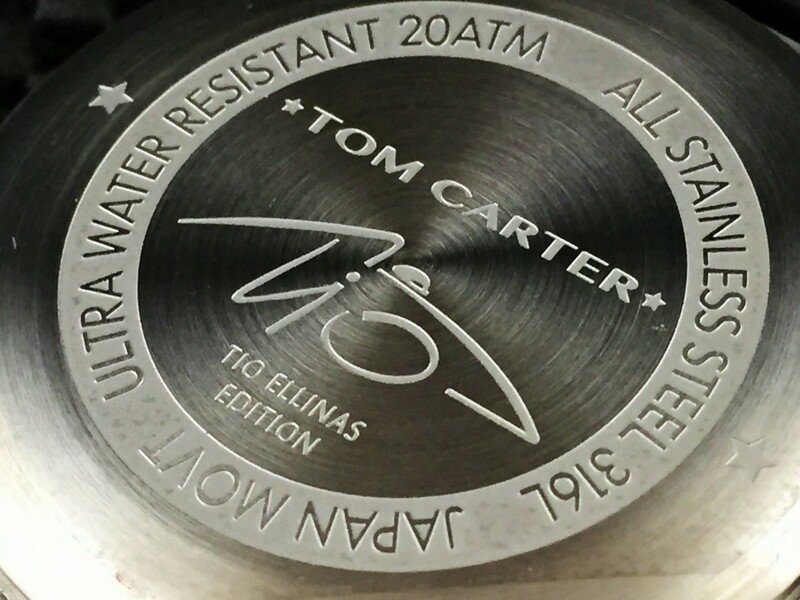 Maybe in future editions Tom Carter will start using luminescent paint. 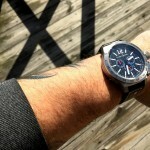 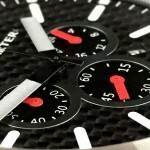 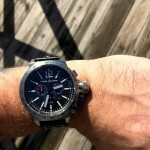 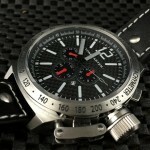 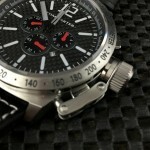 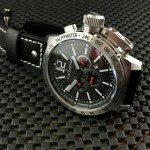 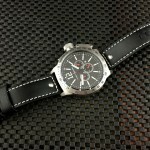 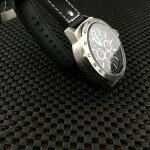 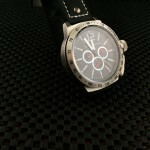 I do like the contrast between the silver hands, carbon fiber dial and red subdial hands. 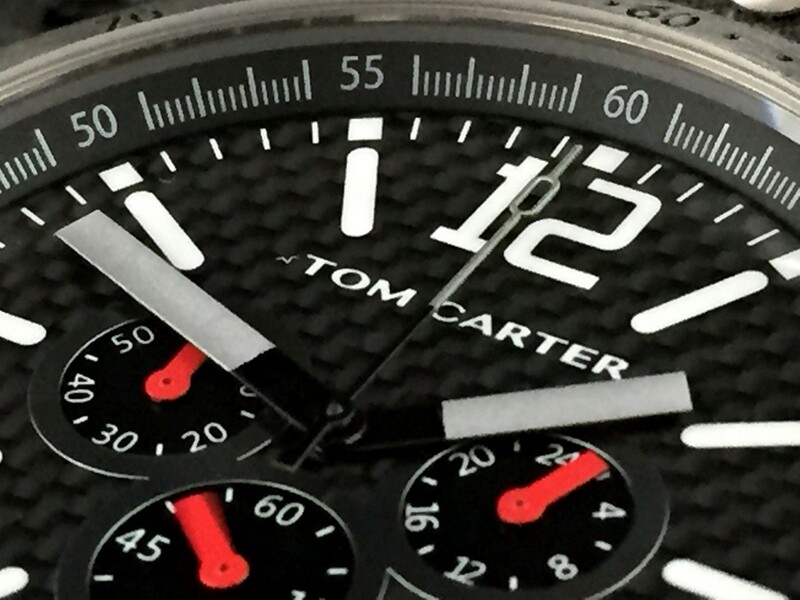 The Tom Carter Black Carbon is equipped with a sapphire crystal with a pretty good AR coating. 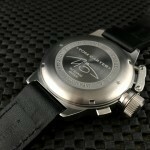 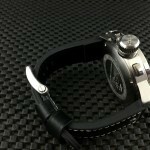 The black leather strap has white contrast box stitching, pilot style “rivets” towards the lugs, and measures in at 22mm. 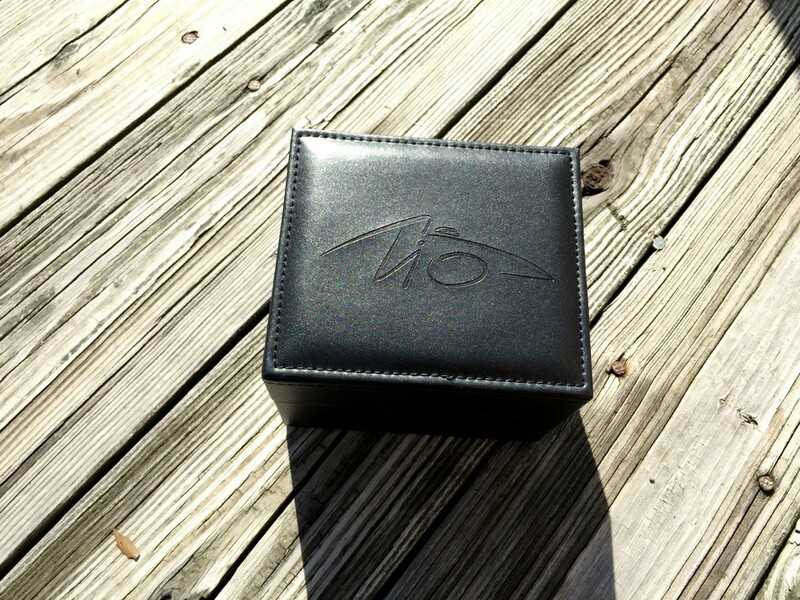 This is one area I wish that was larger. 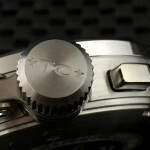 I feel that 22mm lugs make the case seem that much bigger, and they should have gone with 24mm. 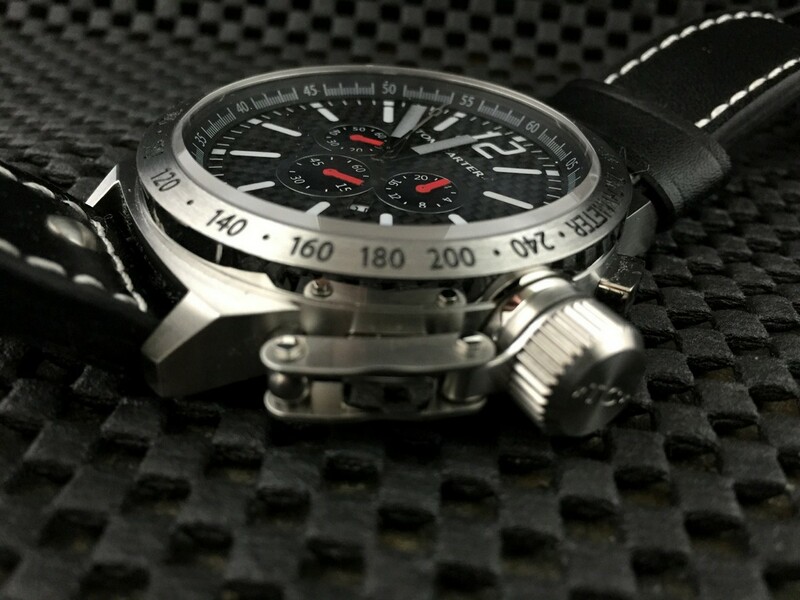 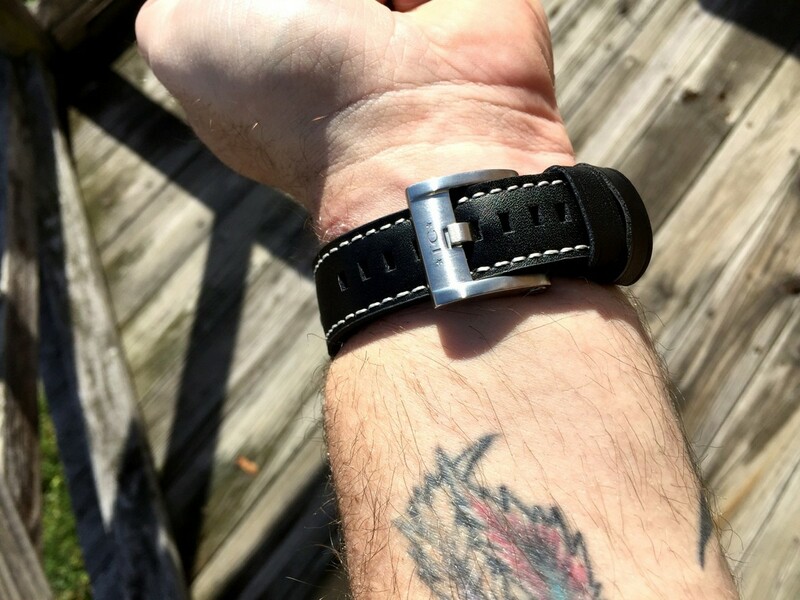 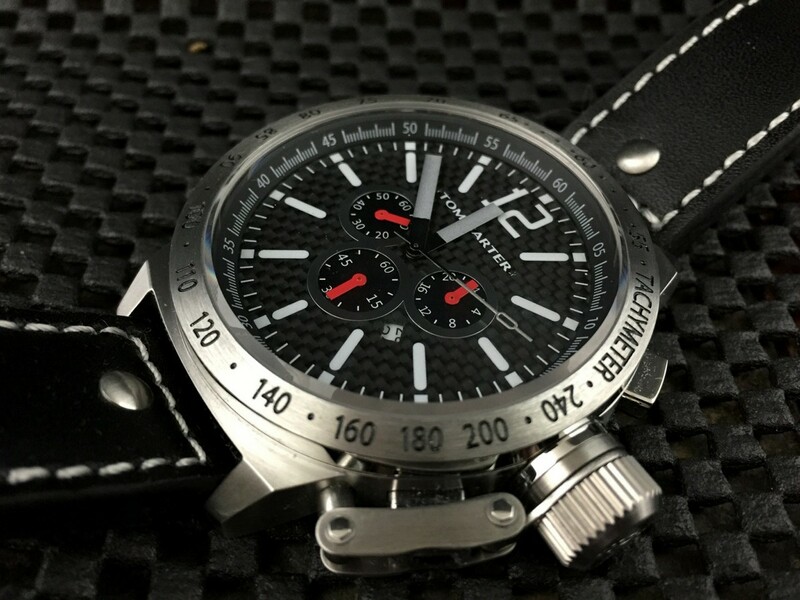 The black leather strap is rugged and seems like it will be very durable, but it is very stiff and will need a good breaking in period. 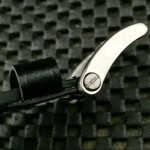 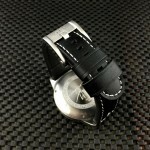 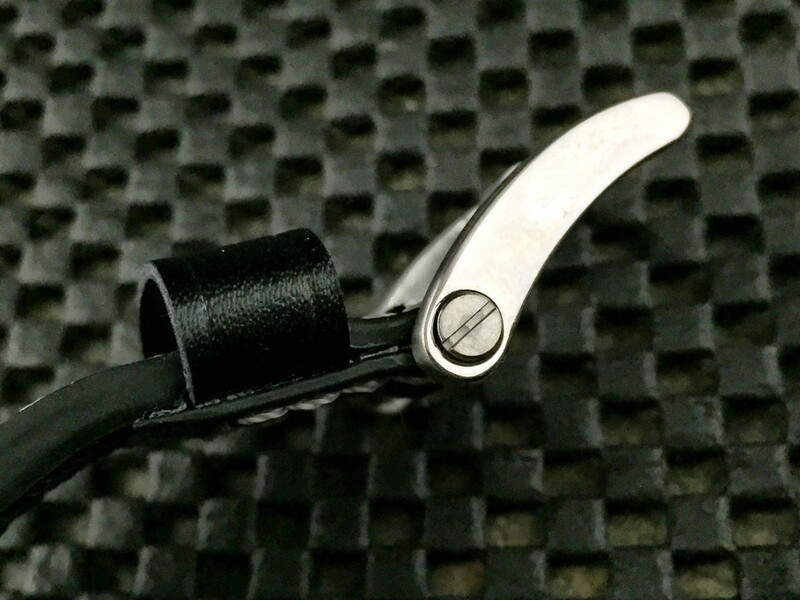 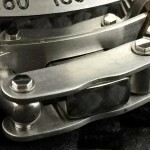 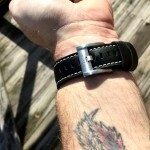 The large custom buckle with oversized screws is fitting for the style of this watch and a nice addition to the strap. 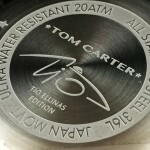 I was glad to see Tom Carter did not just go with a standard off the shelf buckle as so many do. 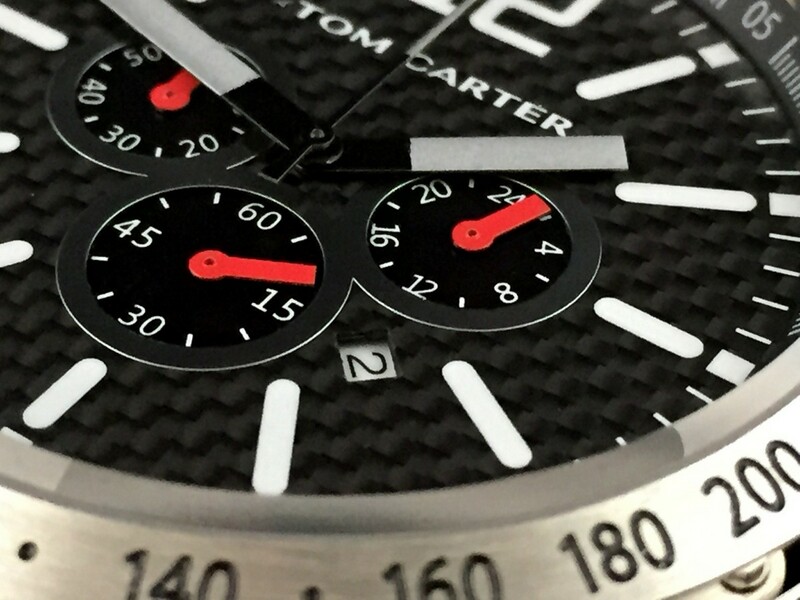 I really ended up looking at the price of the Tom Carter Black Carbon- Tio Ellinas Edition when determining my review summary. 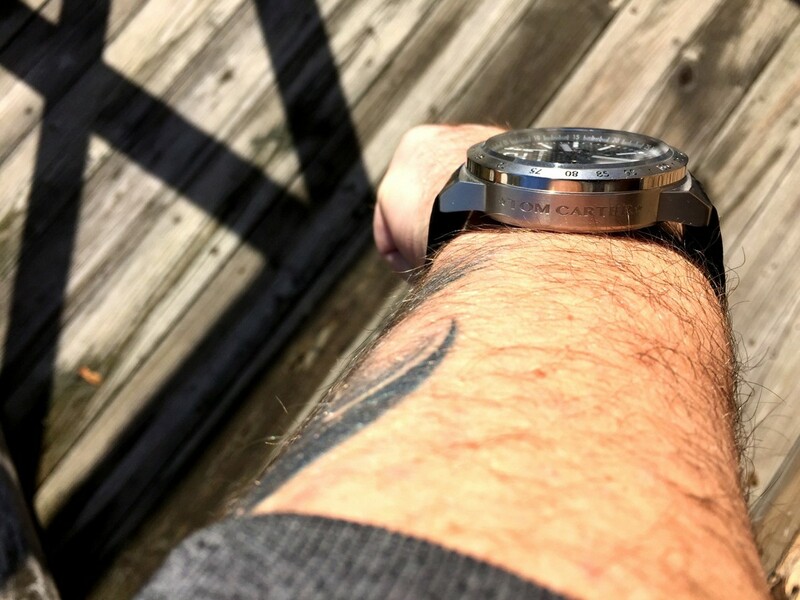 While the style or size is not for me at this point of my watch hobby, overall, it is a pretty good value, especially if you like the large canteen-crown style of watch. 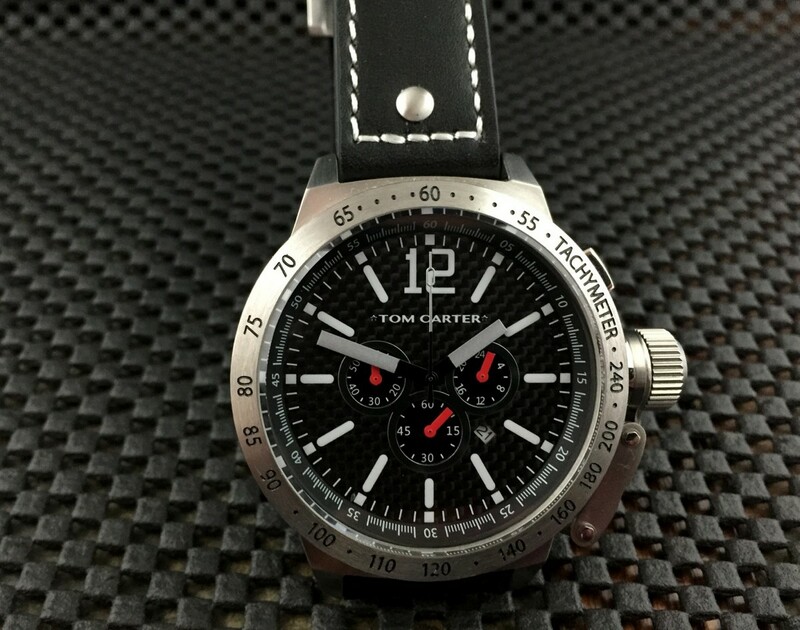 With a sapphire crystal, carbon fiber dial and a dependable Miyota quartz movement, the Black Carbon from Tom Carter has many of the quality components we all look for, and it does so at half the cost of some of its competitors with a similar style.